FRANCISCO CARRIÓN-MENA (Ecuador) said the world economic and financial crisis should have been a turning point for reform in the international financial architecture, yet it had only resulted in superficial changes. Moreover, the United Nations had been unable to respond to the challenges of global economic instability. For its part, Ecuador promoted the creation of a new regional economic architecture to reduce the crisis’ impact. It further stressed the need for regional considerations during trade and financial negotiations and hoped a regional fund could be set up to work through the proposed Unique System of Regional Compensation. Those regional efforts, in turn, should be integrated into a larger framework that went beyond economic and financial spheres, as in the case of the Union of South American Nations. Moreover, regional efforts should complement urgent global reforms, which should include an economic council to guide restructuring and debt concerns. He pointed to a “crisis of multilateralism”, which stemmed from the political turmoil in the Middle East, and underlined the need for Security Council reform in terms of its decision-making mechanisms, working methods and membership. Noting that Ecuador had taken over the chairmanship of the Special Committee on Decolonization, he called for a greater focus on ending colonialism. His Government believed that any action to impose peace would fail and could lead to war. Ecuador had recognized Palestine as a State within 1967 borders, with East Jerusalem as its capital, on 24 December 2010. Thus, it supported Palestine’s admission to the United Nations as a Member State. It meanwhile condemned the trade embargo against Cuba, which had caused serious economic damage, as well as humanitarian problems for the population. Among other issues, he said Ecuador hoped the Rio+20 Conference would result in renewed efforts to bolster sustainable development across its three pillars. 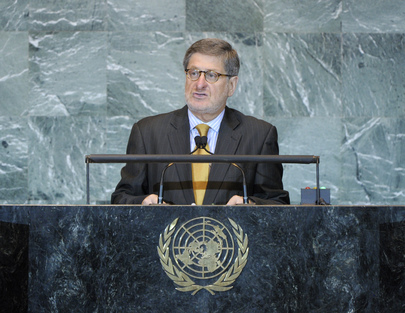 However, the world community must comply with commitments to reduce greenhouse gases; insist on the transfer of new, additional and committed financial resources for developing countries in the face of global threats; and address sustainability, not just as an environmental issue, but as one that addressed the interlinkages between capital, labour, nature and politics. That conference should also specify technology transfer and articulate sustainable development instruments aimed at achieving equality and improving the quality of life. He also highlighted Ecuador’s Yasuni-ITT Proposal, which requested the international community to provide at least half of the income the country had given up by choosing not to access the oil reserves in the biodiverse Yasuni region. On other matters, Ecuador hoped the Conference on Disarmament would address all pending questions. It also called for a resolution of the outstanding issues on the establishment of a nuclear-weapon-free zone in the Middle East. It supported the work to combat the illicit trade in small arms and light weapons, and also had increased its participation in United Nations peacekeeping efforts. However, it was clear that the United Nations system could not meet the present global challenges if it did not reform.